On 17th June the caravan of family and friends of the disappeared and murdered normal school students of Ayotzinapa arrived for their second meeting with the organized indigenous communities of the Indigenous National Congress (CNI), at the ejido San Sebastián Bachajón for a meeting at Cumbre Nachoj, the headquarters of the adherents to the Sixth from Bachajón. “Nine months without returning home, looking for my son,” mother of Ayotzinapa. San Sebastián Bachajón, Chiapas, June 17. “I have spent nine months without returning home, looking for my son,” shared Mrs. Cristina Bautista, mother of Benjamín Ascencio Bautista, a student at the normal school in Ayotzinapa, Guerrero, disappeared by the police along with 42 of his compañeros last September. 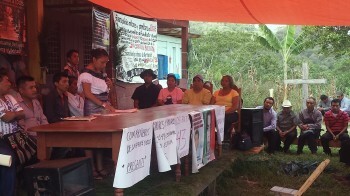 “I never imagined I would get here, being with you gives us strength,” said doña Cristina to the communities of the Indigenous National Congress, adherents to the Sixth from northern Chiapas, meeting in Cumbre Nachoj, headquarters of the ejido in resistance San Sebastian Bachajón, in the municipality of Chilón. “The state has to accept that it was the one that disappeared our children,” stressed the mother of Benjamin, a few days after the judge Ulices Bernabé García from Iguala, Guerrero, now in exile, contradicted the official version of the facts that absolved the federal government from blame. “In Tixtla, Guerrero, we thought it was just us, but all of us in one way or another have been hit by the government,” said doña Bertha Nava, mother of Julio Cesar Ramírez Nava, one of the students killed by the police. Together with her husband Tomás Ramírez, she denounced that in the last days of the electoral process, Tixtla was surrounded by police and soldiers, who did not allow them to move freely. “It is not a crime to look for our children, it is a right,” reiterated doña Bertha. Meanwhile the student Omar Garcia recalled that these meetings with the communities of Chiapas, are with the agreement of the National Indigenous Congress, “to learn about how to build self-management and autonomy.” “Elections do not serve us anything,” stressed Omar who is also a spokesperson for the Ayotzinapa normal school. The meeting was attended by members of the Ejido Bachajón, Ejido Tila and the organisation of the Pueblos Unidos por la Defensa de la Energía Eléctrica (PUDEE) from Sabanilla and Tila, adherents to the Sixth. The words 0f the Ayotzinapa families can be found here: http://radiozapatista.org/?p=13744.